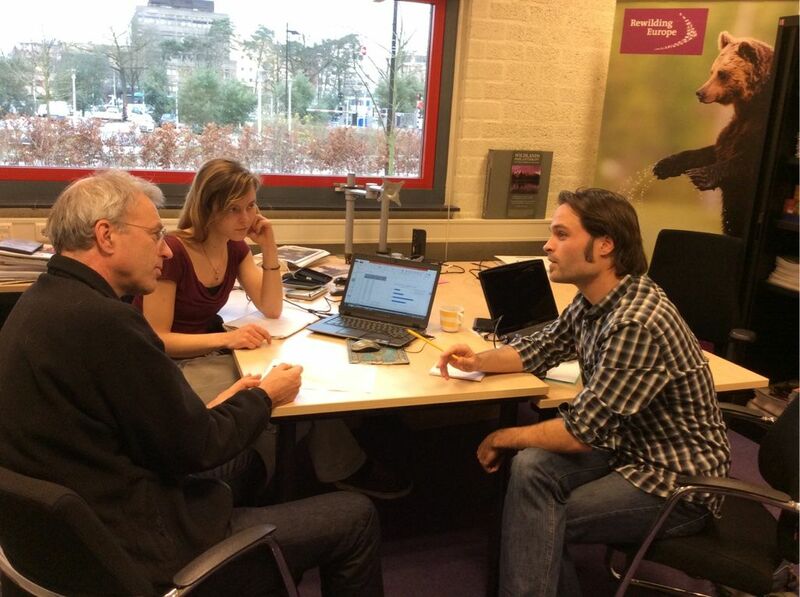 In April 2015, Rewilding Europe offered two internship positions for a desk study to collect information about wildlife in rewilding areas, in particular on the larger mammals and birds. Out of many applications received, one student and a volunteer were selected: Anna Luijten and Jelle Harms from The Netherlands. The goal of the study was to obtain an overview of the key species, their numbers, distribution, trends, habitat preferences and populations estimates. In this blog you can read how it is being an intern at Rewilding Europe. Brown Bear (Ursus arctos) female with cub, Bieszczady Mountains, Eastern Carpathians, Poland. Every year, students go on an internship hunt. They are in search of the most amazing and instructive learning experience; preferably somewhere overseas, like doing scientific research about grazers in Africa, coral reefs in the Caribbean or ecosystems in South-America. Normally, my feet are also itching for some adventurous destination that makes me feel like a true explorer. But this time, for once, I wanted to stay in the Netherlands. Moreover, I had a very good reason for this: Rewilding Europe. I wanted to do my internship within a progressive organization doing hands on conservation work. I was already familiar with Rewilding Europe’s programme and work, and I really liked their point of view and direction in conservation. Therefore, ignoring my fellow students that were on their way to the beach in San Martin, I took the bike braving the Dutch weather, to join the Rewilding Europe team in their home office in Nijmegen. 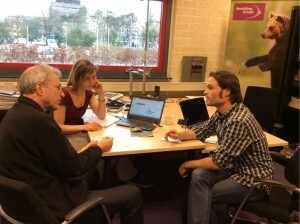 From left: Wouter Helmer, Rewilding Director working with Anna Luijten and Jelle Harms in the Rewilding Europe office in Nijmegen, The Netherlands. As a part of the study, my task was to collect information about numbers of wolves, deer and other species from four different rewilding areas: Western Iberia in Portugal, the Oder Delta bordering Poland and Germany, the Velebit Mountains in Croatia and the Rhodope Mountains in Bulgaria. Working together with my colleague intern, Jelle Harms, we were working to link the wildlife data to the landscapes and habitats in these rewilding areas. One of the first things that struck me about Rewilding Europe is that the home office is rather small with only a few people regularly present and most of the Rewilding Europe team working from different countries across Europe. In October 2015, we had an opportunity to meet the members of the Central Team that flew in for a week to the office in Nijmegen. During that week, we presented the primary results of our study and had interesting discussions with the team members. During our study, I searched and contacted numerous organizations that might have monitored the species involved. Unfortunately, I received only a limited numbers of responses, nonetheless very helpful. However, with only four months to complete the study and having such a low rate of response the successful finalization of my work did not look very promising. To overcome this obstacle I added a few words like hello, in Polish (dzień dobry), Bulgarian (здравей), Croatian (dobar dan) or Portuguese (bom dia) to my e-mail correspondence. To my own astonishment, more people started answering. I found out that approximately 20 elks were roaming in the region of the Oder Delta, that Golden eagles were still the kings of the Western Iberian aviation and that a male bison decided to go on solo-adventure and covered a distance of 80 km to arrive at the border of the Oder Delta region. By collecting the data, I have also enlarged my own species knowledge. Have you ever heard about the marbled polecat (Vormela peregusna), or the troglobitic leech (Croatobranchus mestrovi)? I leave you the excitement of searching these species on the Internet, but they are all occurring in the rewilding areas. The second part of the study was more complicated: how to link species numbers or densities to habitats and the larger landscapes? Luckily, Jelle is an expert in geographic information systems and he already had some ideas of how to tackle this challenge. Together we choose the brown bear in Velebit Mountain area to start a pilot study. Firstly, we made maps representing the living areas of bears in the Velebit, the so-called suitable habitat. To do this, questions needed to be answered like: what does a bear exactly eat in spring, summer and autumn? Do they easily cross roads? Do they prefer to stay high in the mountains or not? 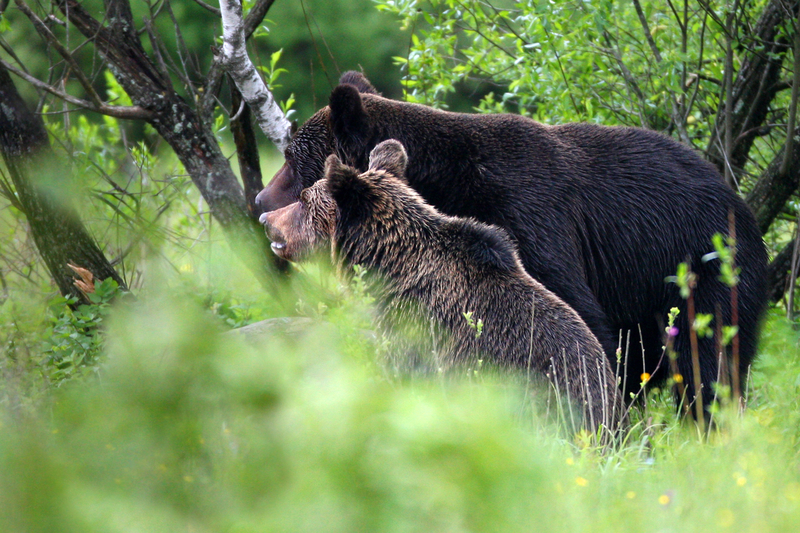 In the end, we calculated that approximately 230 bears are present in the 260,000 hectares large Velebit Mountains. This number is an outcome of our modeling, and now a bear expert knowing the Croatian landscapes should review these results. Being Rewilding Europe’s first “office” intern, I was very pleased to meet and work together with our mentor Wouter Helmer, Frans Schepers, my coworker Jelle and all the other colleagues. Everyone I worked with was very kind and accessible and I would like to thank all of them for this experience. Just last week, one of my fellow students and friends came back from the Caribbean telling me stories about exotic fishes and turtles. I was excited to share with them my stories about wolves and bears and my experience in Rewilding Europe.